Figure 1. Spring of 2017. A saline-sodic headland along state Highway 5 East roadside ditch in Cavalier County, N.D. Wet weather results in shallow groundwater depths and saturated soils, whereas, dry weather results in lower groundwater depths. However, increased evapotranspiration under dry weather results in increased wicking up of soil water (capillary rise) towards the surface. Dry weather is the reason that the “white barren saline-sodic areas”, along the headlands and road-side or in-field ditches have become prominent (Figure 1) in NE North Dakota. Most headlands are adjacent to roadside ditches. When ditches are full of water, the groundwater depths in the ditches and headlands are similar (Figure 2). That leads to shallow groundwater depths in the headlands. Subsoil salts and sodium found in the parent material dissolve in the soil solution and wick to the surface. This results in saturated, saline and sodic soil conditions. 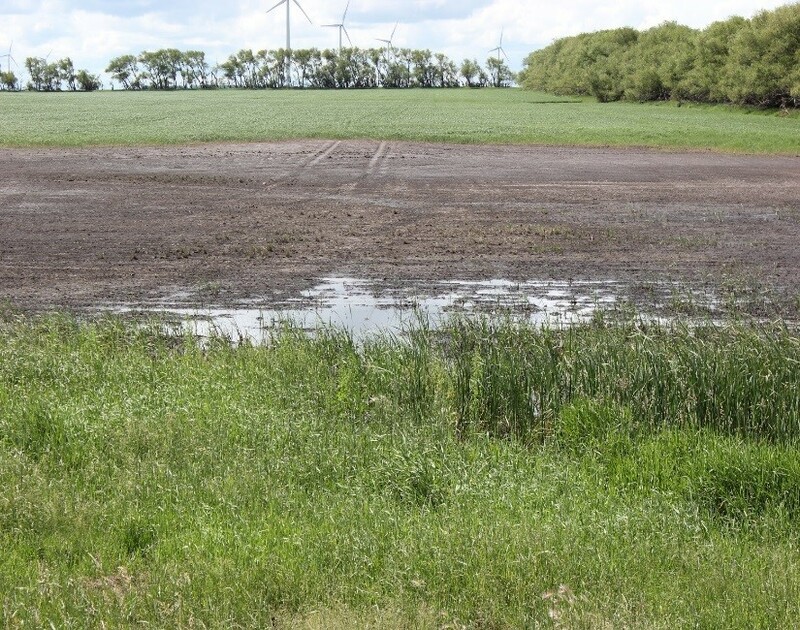 Over time, these areas grow and reduce productivity of once fertile soils. 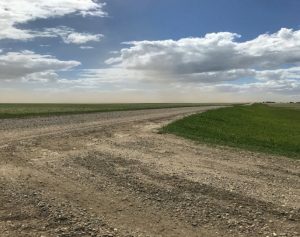 The lack of plant growth increases erosion causing topsoil blow away. It is dollars directly out of producer’s pocket when the precious fertile topsoil blows away. Figure 2. Spring of 2017. A headland alongside a roadside ditch with standing water in Cavalier County, N.D. Notice the standing water on headland and wicking up of soil water towards the higher and productive area. Planting cash crops like wheat, canola, corn or soybean on these saline-sodic headlands will likely result in poor stands. According to the North Dakota State University projected 2018 crop budgets for NE North Dakota, the average planting cost for spring wheat is $93.46 per acre. For canola, it is $139.48 per acre for the same inputs, whereas, for corn and soybeans the input cost is $169.33 and $82.27 per acre respectively. No production in the saline areas results in a net loss. By establishing perennial salt-tolerant covers, we can not only profit from these currently unproductive areas but can also minimize blowing of topsoil (Figure 3). Figure 3. Topsoil blowing away in Benson County in the spring of 2017 (Photo courtesy of Scott Knoke, NDSU Benson County Extension agent). Establishing a vegetative cover is the key to utilize excessive soil moisture, intercepting salt-carrying water before it will affect productive areas, reducing evaporation from the soil surface, adding organic material and increasing microbial activity. Annual crops like barley, oat, sugarbeet and sunflower can be good choices for a cover crop, however, often the Electrical Conductivity (EC) levels of the saline headlands are too high (saturated paste extract EC greater than 4.0 mmhos/cm). This will prevent these crops to yield profitably. In addition, annual crops will require planting every year. On areas having saturated paste extract EC levels of 8.0 or more mmhos/cm (or dS/m), planting strips of salt-tolerant perennial grasses may be a better option. These grasses will grow at EC levels ranging from 14.0 to 26.0 mmhos/cm. Strips could be 30 to 50 feet wide along the headlands, road-side or in-field ditches. Seeding rate for the mix is 7 to 8 pounds per acre and costs about $30 per acre. It takes about one year for these grasses to establish and about two years to suppress weeds. With active management, these strips will require mowing or haying. Mix 1: Is a perennial mix of Tall, Western, Slender, Green (AC Saltlander) Wheatgrasses and Russian Wildrye. Species percentage in the mix will be 21.25% each for Tall, Slender and Western Wheatgrasses along with Russian Wildrye and 15% for Green Wheatgrass. Seeding rate for all five grasses will be 8 pounds per acre with 1.2 pound of Green Wheatgrass and 1.7 pounds each of the other four grasses. Mix 2: If the strips are adjacent to a native rangeland, then Green Wheatgrass should be replaced with Strawberry Clover, which is a broadleaf and is salt-tolerant. That is suggested as Green Wheatgrass is crossed with Quackgrass and rhizomious. This can lead to being invasive. However, if Strawberry Clover is not available, seeding rate for one of the other grasses in the mix for example Western Wheatgrass can be increased. By planting strips of these mixes, white saline areas can be contained and reduced. Plan on this remediation strategy to take three to five years. Producers can either mow or sell their hay made from the strips. In addition, by planting these strips onto the saline headlands, producers may be able to get payments from the government programs. For details, please visit your local Natural Resources Conservation Service office. With time, these headlands might be planted with crops like wheat, canola and corn and soybean again. 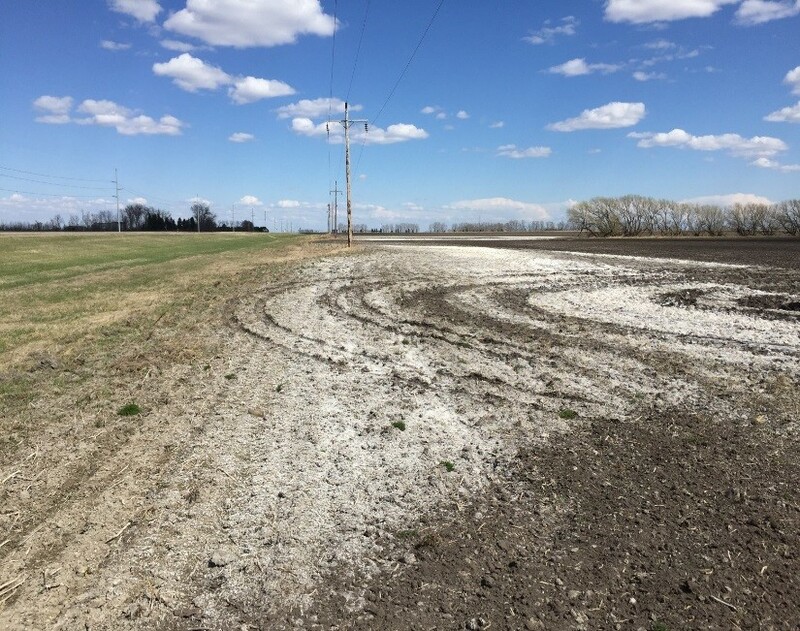 However, if we go through a dry cycle shortly after establishing these strips, headlands may still be one of the worst areas of the field as there will not be enough rain or snow melt to push the salts out of the root zone despite lower groundwater depths. However, with established perennial salt-tolerant covers, remediation of headlands will still continue.